The Lightning Lounge: Do Lightning fans undervalue Alex Killorn's production? Do Lightning fans undervalue Alex Killorn's production? Arguably the most polarizing player in Bolts Nation these days is Alex Killorn. One half of the fan base sees his consistent 40-ish point seasons and concludes that he's a sound second-line option for the Tampa Bay Lightning, while the other half looks at his $4.45M cap hit and thinks the team should be getting more production and fewer cold streaks. It's a debate that raged all year long, and it got me thinking: What is pure point production like Killorn's worth in today's NHL? I think many fans, myself included, are guilty of evaluating production in the context of the post-2004 lockout salary cap situation. $7.5M per season, to me, still sounds like an elite player's salary, but recent history has shown us that it just isn't the case anymore. The standard has been 'revised' by contracts like Connor McDavid's, Anze Kopitar's, Patrick Kane's, and even Steven Stamkos's. What used to be the going rate for a superstar player is now the salary for a very good player. What used to be the salary for a very good player is now the salary of an above average player... and so on, and so on. The impact of this, of course, is that a player like Alex Killorn, who might have gone for $X on the market a few years ago, is now going to $X+$Y today. So, back to the questions at hand: What is production like Killorn's worth in the modern NHL? Is Killorn overpaid by the Lightning? Do fans undervalue his offensive contributions? For the purposes of this analysis, I have decided to completely discount the value of possession numbers, penalty differentials, other 'fancy' metrics, and the mighty intangibles. This is purely about goals and assists, as that's what so many NHL GMs seem to base their financial decisions on these days. 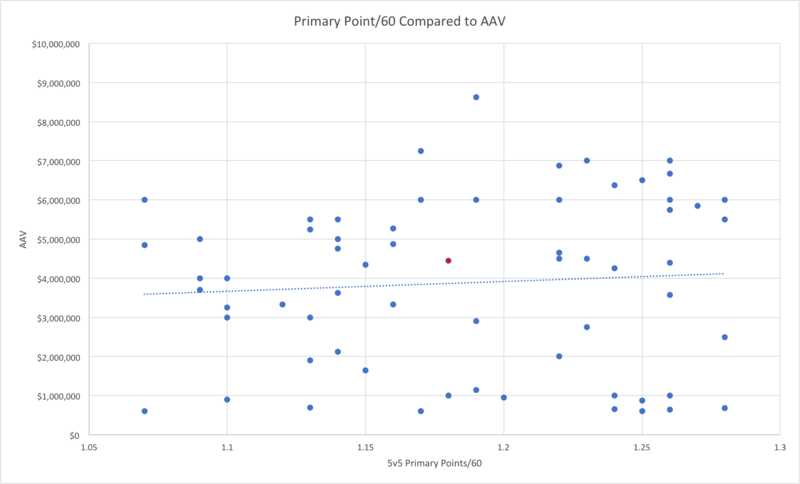 This suggests that, while his overall offensive totals might be slightly below average, his primary point production is above that mark and trending in the right direction. In short, the offensive contributions he is making are typically more valuable than someone whose production is built on a bed of secondary assists. Note that players on entry level contracts were excluded from the analysis, as their salary figures aren't particularly representative of the free market. Once again, Killorn is represented by the red dot. As you can see above, he falls squarely in the middle of the graph's horizontal axis, but tends towards the upper portion of the vertical axis in comparison to the overall trend line. 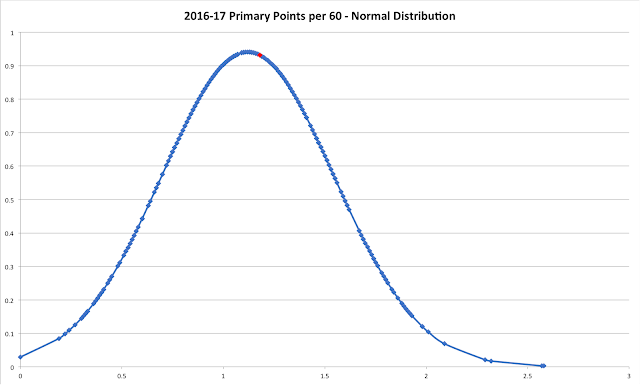 This indicates that the Lightning are paying a slight premium for the total point production they are getting out of Killorn. The story told by the data is a little bit more rosy, but still not indicative of a bargain for Tampa Bay. 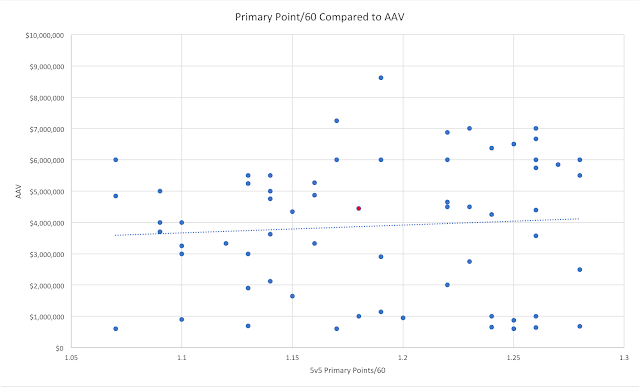 While Killorn finds his primary point production on the right side of the normal distribution, his average annual contract value of $4.45M suggests that his production levels should be there and arguably even higher. Based on the data from both of those charts, production like Killorn's is worth somewhere in the neighbourhood of $3.75M annually when compared to the going market rate for similar players. The Bolts didn't get a hometown discount on this one. Another thing to consider is that this data only takes 2016-17 contract values into consideration; it completely ignores the fact that the Lightning have committed to Killorn's contract for a seven-year term. It's a long-term deal for a player providing the team with middle-of-the-road production. At the same time, though, if the Canadian dollar continues to rebound there is a chance that cap inflation sends the going rate for production of this sort even higher, in which case Killorn's contract may start to look really quite good. Yzerman certainly seems to be hedging his bets here. 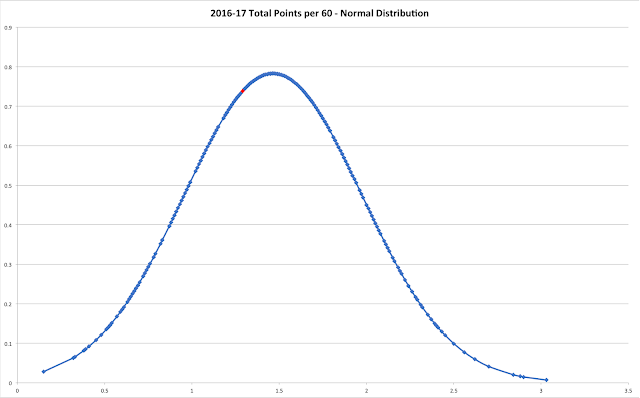 While the primary purpose of my analysis was to look at Killorn's production as an individual, one stark conclusion jumped out at me as I was parsing through the NaturalStatTrick data: Plenty of bargain players can provide middle-six production. 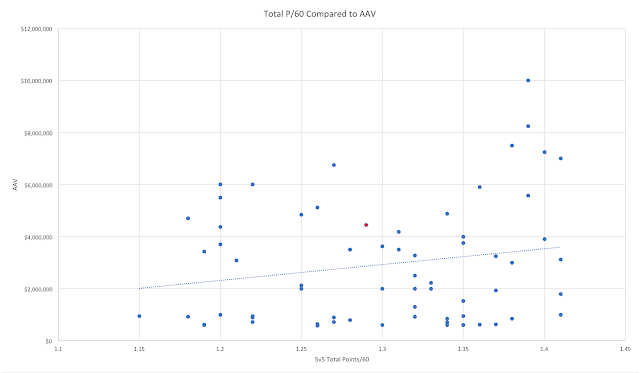 Without having to name names, look at the data plots included in this blog. There are plenty of guys providing tremendous value to their teams in the form of middle-six production at a fraction of the cost the Lightning are incurring for Killorn. That's not to say that Killorn is a bad player, far from it. Rather, it's to suggest that savvy teams out there have a real opportunity to save their dollars for their stars, like Nikita Kucherov, Steven Stamkos, and Victor Hedman, by picking up discount players who, for whatever reason, are seemingly undervalued on the market. With that in mind, I think we can conclude that Lightning fans don't undervalue or overvalue Killorn's production. Those who are excited every time he steps on the ice can comfortably stand behind his established middle-six production to support their argument, while those who complain that the contract he was given is just a bit too rich also have a strong case to make. The bottom line here: Moving forward, the Lightning need to ensure that they aren't giving away big contracts when it's not absolutely necessary. 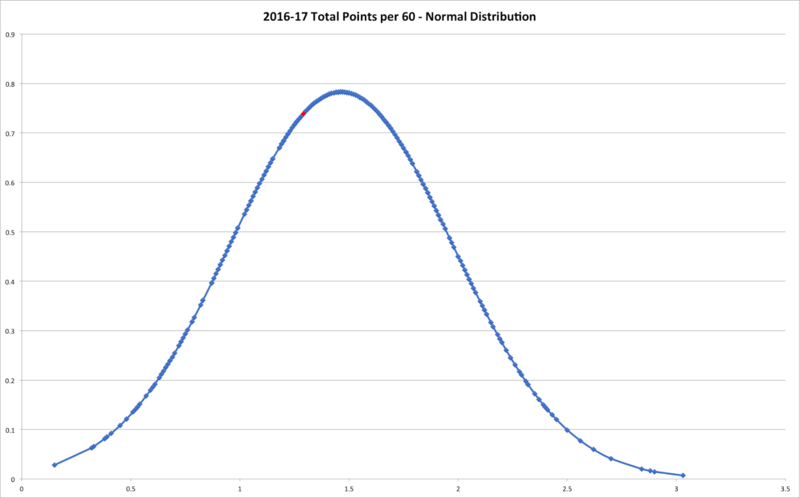 Save the big dollars and long-term deals for the guys who fall to the far right on those normal distributions, and go bargain shopping to fill out the roster. The difference between where Killorn's salary is and where it perhaps should be isn't huge, but if those sorts of gaps start to exist for two, three, four, five, or six players on the roster, all of a sudden there's a problem.